Objective: This study compared the pharmacokinetic (PK) and safety profiles of a fixed-dose combination (FDC) formulation of telmisartan and S-amlodipine with those of concomitant administration of the two drugs. Materials and methods: This was an open-label, randomized, crossover study in healthy male Koreans. All subjects were administered an FDC tablet containing 40 mg telmisartan and 5 mg S-amlodipine and were also coadministered the same dose of both drugs given separately. The crossover study design included a 14-day washout period between the two treatments. Blood samples were collected up to 168 h following drug administration. The plasma concentrations of telmisartan and S-amlodipine were determined by liquid chromatography tandem mass spectrometry. PK parameters and plasma concentration–time curves were compared. Safety was assessed by measuring vital signs, clinical laboratory tests, physical examinations, and patient interviews. Results: The geometric mean ratios and 90% CIs for the maximum plasma concentration (Cmax) and area under the curve from time zero to the last sampling time (AUCt) were 0.8782 (0.8167–0.9444) and 0.9662 (0.9210–1.0136) for telmisartan and 1.0069 (0.9723–1.0427) and 1.0324 (0.9969–1.0690) for S-amlodipine, respectively. A total of 36 adverse events (AEs) were reported by 23 subjects, but no statistical differences were observed between the two treatments. The most frequently reported AE was a mild-to-moderate headache that was generally self-limiting. Conclusion: For both telmisartan and S-amlodipine, the Cmax and AUCt 90% CIs were between ln (0.8) and ln (1.25). These results suggest that the FDC formulation is pharmacokinetically bioequivalent and has a similar safety profile to the coadministration of these drugs. The primary goal of treating hypertensive patients is to achieve the greatest possible reduction in long-term risk of cardiovascular disease. Most patients require therapy with multiple drugs to reach their target BP and reduce the risk of cardiovascular disease.23,24 Monotherapy only achieves the target BP in a minority of patients. A combination of two drugs at low doses is preferable as a first-line treatment when the initial BP is class 2 or 3, the risk of severe cardiovascular events is high or very high, and BP elevation is mild.24 A single combination pill can simplify the treatment schedule and promote adherence.24 The obvious benefits of combination therapy with ARBs and CCBs has led to the development of a fixed-dose combination (FDC) formulation of telmisartan and S-amlodipine for treating hypertension, and a previous study25 determined that there was no pharmacokinetic (PK) interaction between these two drugs. The aim of this study was to compare the PK and safety profiles of an FDC formulation of telmisartan and S-amlodipine with those of coadministration of the two drugs (ClinicalTrials.gov: NCT01340131). The test medication was 40 mg telmisartan/5 mg S-amlodipine FDC tablets (Chong Kun Dang Pharmaceutical Corp., Seoul, Republic of Korea), and the reference tablets were 40 mg of telmisartan (Micardis®; Boehringer Ingelheim, Ingelheim, Germany) and 5 mg of S-amlodipine (Anidipine S®; Chong Kun Dang Pharmaceutical Corp.). Healthy male subjects aged 20–55 years were eligible to participate if their weight was within 20% of ideal body weight in accordance with Broca’s formula. All subjects were considered healthy based on their medical history, physical examinations, 12-lead electrocardiography, and clinical laboratory tests. Subjects with a medical history or diet that might interfere with drug absorption, distribution, metabolism, or excretion were excluded. Subjects were also excluded if any of the following applied: history of allergy or hypersensitivity to telmisartan or amlodipine, history of drug and/or alcohol abuse, systolic blood pressure (SBP) <90 mmHg and/or diastolic blood pressure (DBP) <50 mmHg, participation in a clinical trial within 90 d of first administration of the investigational product, donation of blood within 60 d of first administration of the investigational product; use of medication that would affect drug metabolism within 28 d of the first administration of the investigational product, or use of any medication that could affect the study results within 10 d of first administration of the investigational product. This open-label, randomized, crossover design study was performed at the Clinical Trial Center of Inje University Busan Paik Hospital, Busan, Republic of Korea (ClinicalTrials.gov: NCT01340131). The study protocol and informed consent form were approved by the Institutional Review Board of Inje University Busan Paik Hospital, and all subjects provided written informed consent before participating. We calculated that 28 subjects per treatment would be required to detect a 20% difference between test and reference drugs with 80% statistical power at a 5% level of significance, assuming the interindividual variation in the maximum plasma concentration (Cmax) and the area under the curve from time zero to the last sampling time (AUCt) for telmisartan was 41%. We started the study with 68 subjects, which provided a contingency for patients who might drop out or fail to adhere to both treatments. All subjects were administered an FDC tablet containing 40 mg telmisartan and 5 mg S-amlodipine and were also coadministered the same dose of both drugs given separately. The crossover study design included a 14-day washout period between the two treatments. Subjects were randomly assigned to one of the two treatment sequences in a 1:1 ratio. To measure the plasma concentration of telmisartan, blood samples were collected at 0 (pre-dose), 0.25, 0.5, 0.75, 1, 1.5, 2, 4, 8, 10, 12, 24, 36, and 48 h after administration. To measure the plasma concentration of S-amlodipine, blood samples were collected at 0 (pre-dose), 1, 2, 3, 4, 5, 6, 7, 8, 10, 12, 24, 48, 72, 120, and 168 h after administration. A total of 5 or 7 mL of blood was collected from each subject using a heparinized Vacutainer® tube (Becton Dickinson, Franklin Lakes, NJ, USA). The samples were centrifuged at 3,000 rpm for 10 min and stored at −70°C for assays. A safety assessment was carried out on all subjects who took at least one study drug. Any AEs were reviewed by integrating data from vital signs, clinical laboratory tests, physical examinations, and patient interviews. The plasma concentrations of telmisartan and S-amlodipine were analyzed by Seoul Pharma Laboratories (Seoul, Korea) using liquid chromatography tandem mass spectrometric method. Telmisartan and S-amlodipine were quantified using a mass spectrometer in the multiple reaction monitoring mode with positive electrospray ionization. The calibration curves were linear over the ranges of 2–2,000 ng/mL for telmisartan and 0.05–10 ng/mL for S-amlodipine in plasma, with coefficients of determination (R2) >0.996 and >0.997, respectively. The coefficients of variation (CV) for assay precision were <6.37% and <3.72%, and the accuracies were >92.99% and >88.4% for telmisartan and S-amlodipine, respectively. No relevant cross-talk or matrix effects were observed. The PK parameters of telmisartan and S-amlodipine were assessed by non-compartmental analysis using WinNonlin software (ver 6.1; Pharsight Corp., Mountain View, CA, USA). The AUCt was determined using the trapezoidal rule. The area under the plasma concentration–time curve from time zero to infinity (AUCinf) was calculated using the formula: AUCinf = AUCt + Ct/k, where Ct is the last measured plasma concentration and k is the terminal elimination rate constant. The Cmax and the time to reach Cmax (Tmax) were determined from the plasma concentration–time curve. Continuous variable data are expressed as means ± standard deviations (SDs), and categorical data are expressed as counts or percentages. To assess PK equivalence, Cmax and AUCt were log-transformed, and geometric mean ratios (GMRs) and their 90% CIs were determined. McNemar test was conducted to compare the percentage of AE between treatment groups. Statistical analysis was performed using SAS software (ver 9.4; SAS Institute Inc., Cary, NC, USA). Sixty-eight healthy male subjects were enrolled (mean age, 24.1±1.39 years; mean weight, 70.16±8.28 kg; mean height 175.24±5.68 cm). 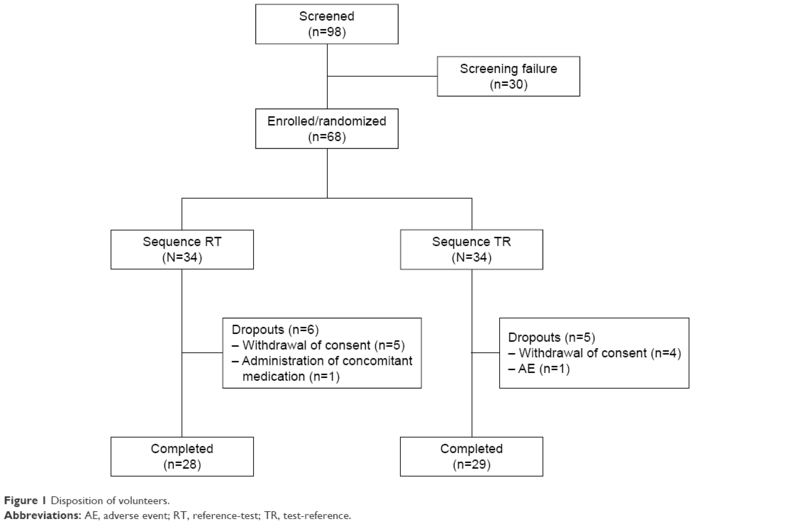 Eleven subjects did not complete the study: nine withdrew their consent, one withdrew due to administration of concomitant medication, and one due to AEs (Figure 1). Safety profiles were determined using data from 68 subjects who were administered study drugs. PK analysis was performed using data from 57 subjects who completed the study. The baseline characteristics of study subjects are shown in Table 1. Figure 1 Disposition of volunteers. Abbreviations: AE, adverse event; RT, reference-test; TR, test-reference. Note: Data are expressed as mean ± standard deviation (min–max). Abbreviations: SBP, systolic blood pressure; DBP, diastolic blood pressure; GOT, glutamin oxalacetic transaminase; GPT, glutamic pyruvate transaminase. The mean plasma concentration–time profiles for the two drugs following administration of 40 mg telmisartan and 5 mg S-amlodipine or the FDC tablet are shown in Figures 2 and 3. Figure 2 Mean (standard deviation) plasma concentration profiles of telmisartan after administration of FDC tablet (40 mg telmisartan/5 mg S-amlodipine) and coadministration of 40 mg telmisartan with 5 mg S-amlodipine in healthy male subjects. Notes: Linear scale (A); Iog scale (B). Figure 3 Mean (standard deviation) plasma concentration profile of S-amlodipine after administration of FDC tablet (40 mg telmisartan/5 mg S-amlodipine) and coadministration of 40 mg telmisartan with 5 mg S-amlodipine in healthy male subjects. Notes: Linear scale (A); log scale (B). The mean Cmax of telmisartan was 122.13±64.55 ng/mL after the FDC tablet and 138.52±65.45 ng/mL after concomitant administration. The median (range) Tmax for telmisartan was 2.0 (0.50–4.00) h after the FDC tablet and 1.5 (0.25–4.00) h after concomitant administration. The mean AUCt and AUCinf for telmisartan were 1,225.73±749.80 and 1,416.01±944.13 ng·h/mL, respectively, after administration of the FDC tablet and 1,268.76±740.52 and 1,448.59±888.73 ng·h/mL, respectively, after concomitant administration. The mean t1/2 of telmisartan was 17.17±6.21 h for the FDC tablet and 17.73±5.43 h for coadministration (Table 2). Notes: Data are expressed as mean ± standard deviation; avalues expressed as median (range). Abbreviations: PK, pharmacokinetic; FDC, fixed-dose combination; Cmax, maximum plasma concentration; Tmax, time to reach Cmax; AUCinf, area under the plasma concentration–time curve from time zero to infinity; AUCt, area under the curve from time zero to the last sampling time; t1/2, terminal elimination half-life. The mean Cmax of S-amlodipine was 2.83±0.58 ng/mL after the FDC tablet and 2.83±0.71 ng/mL after concomitant administration. The median (range) Tmax for S-amlodipine was 5.00 (4.00–10.00) h after the FDC tablet and 5.00 (3.00–8.00) h after concomitant administration. The mean AUCt and AUCinf for S-amlodipine were 145.57±37.37 and 159.08±46.60 ng·h/mL, respectively, after administration of the FDC tablet and 141.46±36.79 and 154.28±45.37 ng·h/mL, respectively, after concomitant administration. The mean t1/2 of S-amlodipine was 44.20±8.62 h for the FDC tablet and 43.85±9.67 h for coadministration (Table 2). The GMRs (90% CIs) of Cmax and AUCt were 0.8782 (0.8167–0.9444) and 0.9662 (0.9210–1.0136) for telmisartan and 1.0069 (0.9723–1.0427) and 1.0324 (0.9969–1.0690) for S-amlodipine, respectively (Table 3). Abbreviations: PK, pharmacokinetic; FDC, fixed-dose combination; CV, coefficient of variation; Cmax, maximum plasma concentration; AUCt, area under the curve from time zero to the last sampling time. During the study, a total of 36 AEs were reported by 23 subjects. The number of subjects reporting AEs following the FDC tablet (n=17) and coadministration (n=19) was similar. The most frequently reported AE was a mild-to-moderate headache that was generally self-limiting. There were no statistically significant differences between the FDC tablet and coadministration treatments (McNemar test, p=0.9268). Headaches were more frequent after coadministration of telmisartan and S-amlodipine (n=11) than following the FDC tablet (n=8). Drug-related AEs (FDC tablet vs co-administration) included headaches (n=7 vs 9), dizziness (n=1 vs 1), increased levels of AST (n=0 vs 1), increased levels of ALT (n=0 vs 1), increased levels of creatinine in the blood (n=1 vs 0), and hypotension (n=1 vs 0). The baseline level of serum creatinine of one subject in the FDC group was 0.91, increased to 1.57, and normalized to baseline level. The baseline values of SBP and DBP of one subject in the FDC group were 113 and 74, respectively, decreased to 86 and 45, and normalized to baseline level. Two events necessitated intervention: one case of severe headache required administration of acetaminophen, and one case of mild hypotension required BP monitoring. The other AEs were mild and resolved spontaneously; there were no serious AEs. No clinically significant changes were observed in the vital signs, laboratory test results, during the physical examinations, or on the electrocardiograms. After administration of FDC tablet and coadministration, the maximum decreases in mean SDP and DBP were 115.42±10.63 and 63.53±7.34, respectively (Figure 4). Figure 4 Mean (standard deviation) SBP and DBP after administration of FDC tablet (40 mg telmisartan/5 mg S-amlodipine) and coadministration of 40 mg telmisartan with 5 mg S-amlodipine in healthy male subjects. Notes: SBP (A); DBP (B). Abbreviations: SBP, systolic blood pressure; DBP, diastolic blood pressure; FDC, fixed-dose combination. This study evaluated the PKs and safety profiles of an FDC formulation containing 40 mg telmisartan and 5 mg S-amlodipine, together with coadministration of the same doses of both drugs given separately. The 90% CIs for GMRs of the PK parameters Cmax and AUCt were within the acceptable limits of bioequivalence (0.8–1.25), indicating that the FDC formulation was bioequivalent to coadministration. Additionally, no statistically significant clinical differences were observed among the AEs that followed administration of the two formulations. S-amlodipine is the most effective calcium-channel-blocking form of amlodipine.22 The R-amlodipine isomer is ~1,000-fold less potent as a CCB.29 Therefore, the antihypertensive and anti-anginal effects of amlodipine are attributed to S-amlodipine, whereas R-amlodipine is considered an inactive or counterproductive impurity.30 Therefore, in this study, we used S-amlodipine as our CCB. When this study was planned, we had no information on the intra-individual variation of the primary PK parameters Cmax and AUCt. We assumed that the intra-individual variation would be lower than the interindividual variation and calculated our sample size using the intra-individual variation information from other studies. The intra-individual CVs in Cmax and AUCt for telmisartan was 23.17% and 15.28%, respectively. The intra-individual CVs in Cmax and AUCt for S-amlodipine was lower at 11.16% and 11.14%, respectively. Therefore, there were enough study subjects to compare the PK profiles of the FDC and coadministration of telmisartan and S-amlodipine. This study had several limitations. It used a single dose and included only healthy male participants in the fasted state. Because these conditions are not representative of the general hypertensive patient population, a further long-term study of hypertensive patients is warranted. Also, because all participants were Asian (Korean) males, another study is needed in order to generalize this result to other populations. This study demonstrates that the PK profile of an FDC formulation of telmisartan and S-amlodipine was bioequivalent to the coadministration of these drugs. The corresponding safety profiles were also similar, and both formulations of telmisartan and S-amlodipine were well tolerated. The funding for this study was provided by Chong Kun Dang Pharmaceutical Corp. (Seoul, Republic of Korea), and we thank Ji-Hong Shon of the US the Food and Drug Administration for his support in this clinical trial. Kearney PM, Whelton M, Reynolds K, Muntner P, Whelton PK, He J. Global burden of hypertension: analysis of worldwide data. Lancet. 2005;365(9455):217–223. Lewington S, Clarke R, Qizilbash N, Peto R, Collins R; Prospective Studies Collaboration. Age-specific relevance of usual blood pressure to vascular mortality: a meta-analysis of individual data for one million adults in 61 prospective studies. Lancet. 2002;360(9349):1903–1913. Mills KT, Bundy JD, Kelly TN, et al. Global disparities of hypertension prevalence and control: a systematic analysis of population-based studies from 90 countries. Circulation. 2016;134(6):441–450. cdc.gov [homepage on the Internet]. Hypertension Among Adults in the United States: National Health and Nutrition Examination Survey, 2011–2012. Centers for Disease Control and Prevention; 2013. Available from: https://www.cdc.gov/nchs/products/databriefs/db133.htm. Accessed November 3, 2017. 100 indicators of Korean Statistical Information Service. 2015. Available from https://kosis.kr/nsportalStats/nsportalStats_0102Body.jsp;jsessionid=uMBw1xbPFOdNUBjXEBfDU7n9aGSkYXI3m1htNKgAl0AN7qUsg0lJGgobaQp8OyA9.STAT_WAS1_servlet_engine1?menuId=11&NUM=1075. Accessed November 28, 2017. Kim HS, Chang K, Koh YS, et al. CYP2C19 poor metabolizer is associated with clinical outcome of clopidogrel therapy in acute myocardial infarction but not stable angina. Circ Cardiovasc Genet. 2013;6(5):514–521. Kim HS, Kim GY, Yeo CW, et al. The effect of Ginkgo biloba extracts on the pharmacokinetics and pharmacodynamics of cilostazol and its active metabolites in healthy Korean subjects. Br J Clin Pharmacol. 2014;77(5):821–830. Kjeldsen SE, Julius S. Hypertension mega-trials with cardiovascular end points: effect of angiotensin-converting enzyme inhibitors and angiotensin receptor blockers. Am Heart J. 2004;148(5):747–754. Rosario BH, Hendra TJ. Telmisartan in the treatment of hypertension. Expert Opin Drug Metab Toxicol. 2008;4(4):485–492. Benndorf RA, Boger RH. Pleiotropic effects of telmisartan: still more to come? J Hypertens. 2008;26(5):854–856. Burnier M, Brunner HR. Angiotensin II receptor antagonists. Lancet. 2000;355(9204):637–645. Neutel JM, Frishman WH, Oparil S, Papademitriou V, Guthrie G. Comparison of telmisartan with lisinopril in patients with mild-to-moderate hypertension. Am J Ther. 1999;6(3):161–166. Karlberg BE, Lins LE, Hermansson K. Efficacy and safety of telmisartan, a selective AT1 receptor antagonist, compared with enalapril in elderly patients with primary hypertension. TEES Study Group. J Hypertens. 1999;17(2):293–302. Benson SC, Pershadsingh HA, Ho CI, et al. Identification of telmisartan as a unique angiotensin II receptor antagonist with selective PPARgamma-modulating activity. Hypertension. 2004;43(5):993–1002. Abernethy DR. The pharmacokinetic profile of amlodipine. Am Heart J. 1989;118(5 Pt 2):1100–1103. Carvalho M, Oliveira CH, Mendes GD, Sucupira M, Moraes ME, De Nucci G. Amlodipine bioequivalence study: quantification by liquid chromatography coupled to tandem mass spectrometry. Biopharm Drug Dispos. 2001;22(9):383–390. Liu Y, Jia J, Liu G, Li S, Lu C, Yu C. Pharmacokinetics and bioequivalence evaluation of two formulations of 10-mg amlodipine besylate: an open-label, single-dose, randomized, two-way crossover study in healthy Chinese male volunteers. Clin Ther. 2009;31(4):777–783. Park JY, Kim KA, Park PW, et al. Pharmacokinetic and pharmacodynamic characteristics of a new S-amlodipine formulation in healthy Korean male subjects: a randomized, open-label, two-period, comparative, crossover study. Clin Ther. 2006;28(11):1837–1847. Meredith PA, Elliott HL. Clinical pharmacokinetics of amlodipine. Clin Pharmacokinet. 1992;22(1):22–31. Murdoch D, Heel RC. Amlodipine. A review of its pharmacodynamic and pharmacokinetic properties, and therapeutic use in cardiovascular disease. Drugs. 1991;41(3):478–505. Luksa J, Josic D, Podobnik B, Furlan B, Kremser M. Semi-preparative chromatographic purification of the enantiomers S-(−)-amlodipine and R-(+)-amlodipine. J Chromatogr B Biomed Sci Appl. 1997;693(2):367–375. Goldmann S, Stoltefuss J, Born L. Determination of the absolute configuration of the active amlodipine enantiomer as (−)-S: a correction. J Med Chem. 1992;35(18):3341–3344. Littlejohn TW 3rd, Majul CR, Olvera R, et al. Results of treatment with telmisartan-amlodipine in hypertensive patients. J Clin Hypertens (Greenwich). 2009;11(4):207–213. Mancia G, De Backer G, Dominiczak A, et al. 2007 ESH-ESC Practice Guidelines for the Management of Arterial Hypertension: ESH-ESC Task Force on the Management of Arterial Hypertension. J Hypertens. 2007;25(9):1751–1762. Noh YH, Lim HS, Kim MJ, et al. Pharmacokinetic interaction of telmisartan with s-amlodipine: an open-label, two-period crossover study in healthy Korean male volunteers. Clin Ther. 2012;34(7):1625–1635. James PA, Oparil S, Carter BL, et al. 2014 evidence-based guideline for the management of high blood pressure in adults: report from the panel members appointed to the Eighth Joint National Committee (JNC 8). JAMA. 2014;311(5):507–520. Mancia G, Fagard R, Narkiewicz K, et al. 2013 ESH/ESC Guidelines for the management of arterial hypertension: the Task Force for the management of arterial hypertension of the European Society of Hypertension (ESH) and of the European Society of Cardiology (ESC). J Hypertens. 2013;31(7):1281–1357. da Silva PM. Efficacy of fixed-dose combination therapy in the treatment of patients with hypertension: focus on amlodipine/valsartan. Clin Drug Investig. 2010;30(9):625–641. Zhang XP, Loke KE, Mital S, Chahwala S, Hintze TH. Paradoxical release of nitric oxide by an L-type calcium channel antagonist, the R+ enantiomer of amlodipine. J Cardiovasc Pharmacol. 2002;39(2):208–214. Rentsch KM. The importance of stereoselective determination of drugs in the clinical laboratory. J Biochem Biophys Methods. 2002;54(1–3):1–9. Deppe S, Boger RH, Weiss J, Benndorf RA. Telmisartan: a review of its pharmacodynamic and pharmacokinetic properties. Expert Opin Drug Metab Toxicol. 2010;6(7):863–871. Yamada A, Maeda K, Ishiguro N, et al. The impact of pharmacogenetics of metabolic enzymes and transporters on the pharmacokinetics of telmisartan in healthy volunteers. Pharmacogenet Genomics. 2011;21(9):523–530. Ieiri I, Nishimura C, Maeda K, et al. Pharmacokinetic and pharmacogenomic profiles of telmisartan after the oral microdose and therapeutic dose. Pharmacogenet Genomics. 2011;21(8):495–505.